Biggie is certainly not a forgiving man and the lazy housemates definitely have first-hand experience at the man’s wrath. 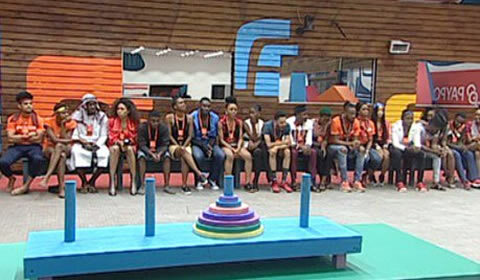 The Housemates were clearly ready for their Friday night games and due to recent loses, they all had some kind of point to prove. And like soldiers well prepared for combat, they all geared up in their usual orange uniform and awaited Biggies signal. However, the oga had different plans. Instead of their usual attire, he handed them their freedom on a silver platter and allowed them to dress to impress while showing off their pair’s uniqueness. This to further inspire them to work smarter perhaps. For starters, Bamteddy (Bambam, Teddy A) and Rineeka (Rico Swavey, Ahneeka) were disqualified with immediate effect after failing to heed to Biggie’s attire instruction and came dully geared up in their battle uniform. This seems to have been ‘saving grace’ from Biggie because all the participating pairs, from Van-Dee (Vandora, Dee-One) to Leolex (Leo, Alex) failed miserably. It's better to miss a fight than lose it maybe. Not? The Housemates were tasked with completing a four levelled puzzle challenge made up of colour coordinated balls, pyramid forming circles, and angular objects to be used to form a square. With ten minutes on the clock, to say they failed would be disrespectful to the word itself. The Housemates were tormented. With all the pairs getting stuck on square making puzzle, one similar to the previous week’s challenge where Angel proved his superiority and hit the nail on the head, winning himself a treat. Even the champ himself drowned. The Game in its entirety is proving to be more difficult than meets the eye and the Housemates seem to be approaching it carelessly, showing absolutely no urgency in their executions and constantly celebrating failure. Even after having been warned by both Biggie and Ebuka, they seem to be fully submerged in the pool of comfort. So much so that till now, their strategies or lack thereof are like white paint on a clean canvass, unclear. Will this change? Only time will tell.